Ever noticed how tall our cities are getting? And it seems like just yesterday that our inner suburbs were close to the Central Business District and the “burbs” were the divide between urban and rural. As we move out further and the rural fringe becomes the suburbs, our plots get smaller and communal blocks of units and townhouses become more prevalent. Our need for indoor living space is overtaking our once proud outdoor entertaining tradition. Alongside this is a resurgence of old fashion ways, getting back to healthy lifestyles and patterns, fresh fruit and vege, ethically treated animal produce, we are cooking more and more or at the least going to restaurants that boast all things organic and macro biotic…. So how do to the 2 cultures diverge, how do we live our inner city life and stay true to the ways handed down by Gran (who made her own bread from actual ingredients without a bread maker)? How do we bring a little rural into our urban? 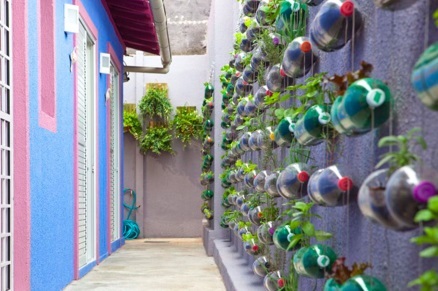 Vertical Gardening is a new way to restore traditional rural values in our urban society. 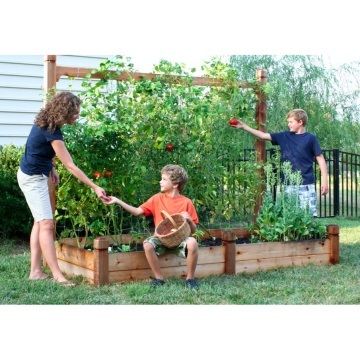 Using a trellis is a time honoured tradition when growing vine fruit and vege. Passion fruit and grapes, olives and tomatoes, combinations of all sorts of fruiting plants can thrive when trained to grow up a trellis. This is also a great space saving idea, simply attached the trellis to a border fence and dig out a small patch to build up the bed underneath. If you are working with a small area without boundary fencing, a garden box with a frame will also work by attaching the lattice to the box frame. Ideally hanging soil bags are best suited to an area where some sort of steel mesh is available or able to be fitted. The idea is to plant in the soil bag, the bag must be a tight enough weave to hold the potting mix but also to allow drainage. Materials such as hessian or woven polypropylene are ideal for this process. This is a really good idea for cultivating seedlings or hanging plants such as strawberries. Upside down Tomato Planters are a fabulous idea for terraces and balconies or anywhere really where ground space is prohibitive. The idea is to literally plant upside down. You can use anything really; a plastic soft drink bottle, a bucket or you can buy the ready made planters from garden supplies. It’s a matter of cutting a hole in the bottom of what you choose to use, just large enough to allow the plant to hang through. Then you attach a small aluminium chain to both your apparatus and a hook and hang your plant. The fruit of these plants tends to be succulent and bulbous because the fruit is that last port of call for the moisture in the soil. Using old wooden pallets is a fantastic idea to condense a large expanse of small fruiting plants into one small area and keep them there past seedling stage. When planting you would use silt matt or hessian to hold the internal structure together and create small holes within the cavity for the plants to pop through. The pallet can be free standing or be mounted against a fence or wall. This is a good option for decks and balconies as well. 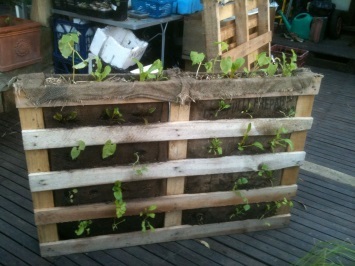 Using recyclable items in your garden isn’t just about compost and chook manure. So many wonderfully inventive things can be done with things like PET plastic bottles and PVC piping. 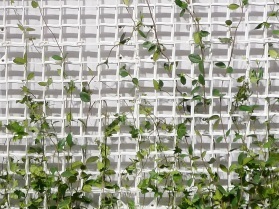 Any wall will come alive with colour and movement with a vegetable or herb garden feature using these sorts of materials and it’s as simple as a suspended wire frame and some old soft drink bottles, these materials are ideal for a herb garden or intermingling ornamental fruits such as chilli’s or even some berries. 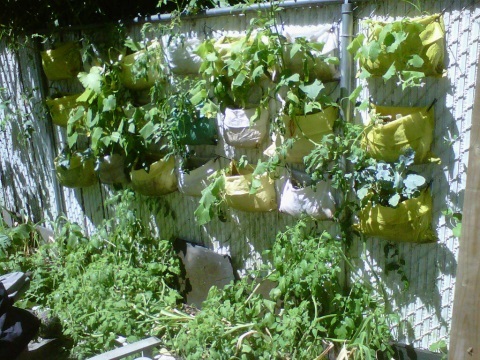 Don’t forget shade cloth for your new vertical vegetable garden. We manufacture and sell various grades and colours of UV stabilised shade mesh online. 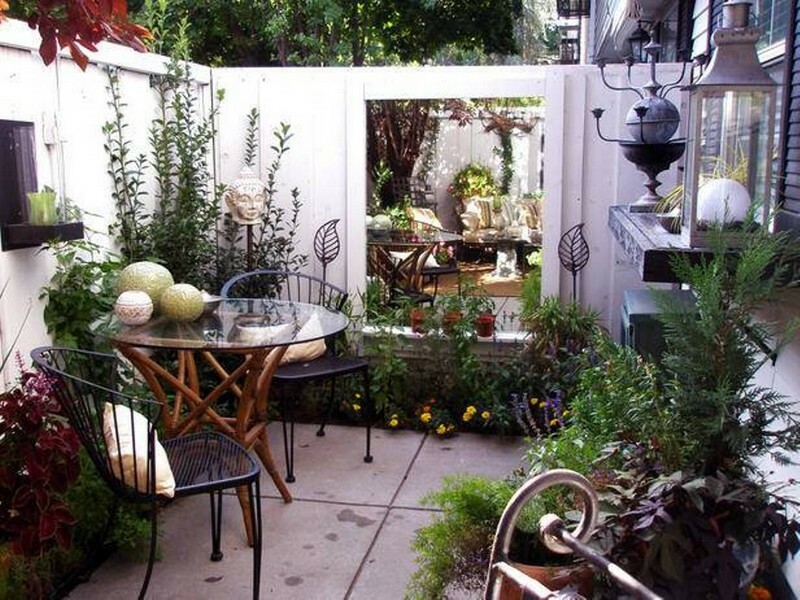 This entry was posted in Gardening on November 18, 2013 by Site Shade Admin.